Fibermaq, a Brazilian provider of machinery for composites molding, has supplied three machines to the local Brazil operations of the Italian company Polynt. 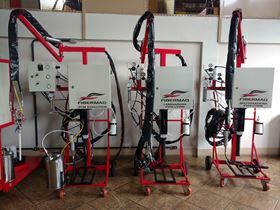 Fibermaq, a Brazilian provider of machinery for composites molding, has supplied three machines to the local Brazil operations of Italian company Polynt, a company specialized in the production of resins, gelcoats and plastic putty. The equipment, which consist of spray-up, gelcoat and RTM injection machines, have been adapted to enable Polynt's technicians to transport them to their clients. ‘We resized the structures of the machines to allow them to be more compact and portable, but their flow and performance are exactly the same as the conventional models,’ said Christian de Andrade, director of Fibermaq. The machines will be used for both external demonstrations and testing at the company’s plants in the states of São Paulo (Taboão da Serra and Piracicaba) and Rio Grande do Sul (Caxias do Sul). This story is reprinted from material from Fibermaq, with editorial changes made by Materials Today. The views expressed in this article do not necessarily represent those of Elsevier.